Here's a treat bag that we made for Valentine's Day but you can make it for any occasion. It only requires a strip of patterned paper and a few small pieces of cardstock. Isn't it cute? And full of chocolate, so who can resist? Circles: 1 3/8" and 1 3/4" punches. Trim & decorate as desired. I ran across you cute little bag with no directions. 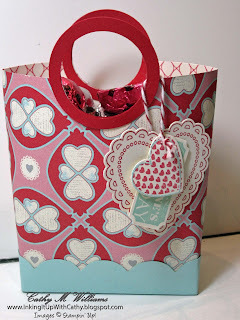 I do not know if you still have directions but I would love to make this little bag. Paula, thank you for checking out my blog. I went ahead and added some dimensions and basic instructions to the post. I hope those will be sufficient so you can make one.